What a fine picturesque day for an estate auction, thought Jack. Endless blue skies blending in peaceful harmony with an outdoor sale. Early customers, like him, perusing over items in anticipation to buy with either a raised hand or nod of their head. Jack found tools he wanted. The sale moved to the tables and Jack noticed his wife standing amid the bidders. Oh, no…someone please intercept her bid, we already have too many at home, he thought. Inspiration: Friday Fictioneers | Rochelle Wisoff-Fields-Addicted to Purple. THE KEY: MAKE. EVERY. WORD. COUNT. For the Weekly Photo Challenge: Family, I thought about families worldwide who struggle with hunger. In every corner of the world, one can find someone in need to eat a decent, nourishing meal. To me, sharing our time, extra resources and love with those in our community who struggle to feed their loved ones, defines the true family. 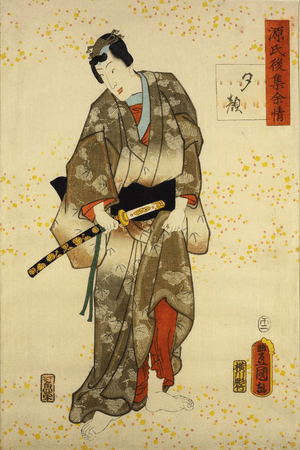 In the classic Japanese novel, Tale of Genji, one of Genji’s lovers, Yuugao, dies because of a jealous curse placed on her. Back then, they really believed evil thoughts could kill! The Carpe Diem’s Distillation challenge is to distill a haiku in reference to the selected text below. As Genji mourns the loss of Yuugao while “looking at the smoke from the pyre…” he recited his thoughts. I remember the day. You asked, “Hey, you wanna come over? Dinner. Meet my parents.” I remember fear. I must have said yes. To that moment. You picked me up. Punctual as always – seven o’clock. As you opened the car door, you handed me a white rose. From my mom’s garden – you said. I smiled – said thanks. We drove not too long to your parent’s place. I remember thinking, hoping, praying. Please let this be real. Those silk roses – darn, they look so real. Some even come with dewdrops on their detailed etched leaves. I reach out, gently to touch your warm cheeks. In that moment, a faint fragrance from your mother’s flower beds rise up to greet me. Perhaps this delicate blossom is right for me to pick. I wonder. Should I? Written for the Ligo Haibun Challenge.